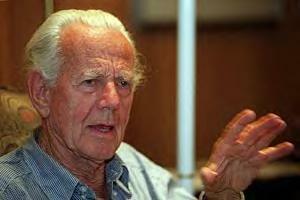 John Dobson has probably inspired more people to become amateur astronomers than any other single person in history. As a chemist turned monk, he built his first telescope while at a California monastery. His first views of the moon changed his life, and in a very real way, the future of amateur astronomy. Dobson would occasionally take his hand-made telescopes into San Francisco where he would set up to give people views of the moon and planets. This is how he came to call himself a "sidewalk astronomer". 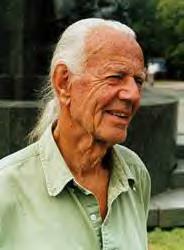 John Dobson is renowned as a telescope maker. 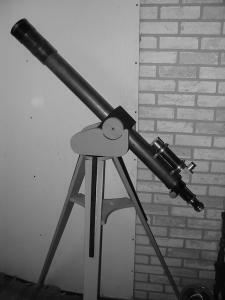 The design of his style of telescopes are based on a WWII gun mount, the base being able to turn left or right while the barrel, or tube, moved up or down. Along with surplus portholes from naval ships which he learned to grind and polish into a mirror, these telescopes offered large apertures for very little money. The design worked very well to give silky-smooth operation while staying in whatever position the operator put it. 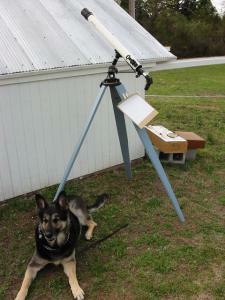 This style of telescope is now called a Dobsonian in honor of John's exceptionally impressive invention. But John might be better known throughout history as one who's passion was to take astronomy to the masses. His days as a sidewalk astronomer together with his treks each summer to state parks all over the western states were meant to do one thing, offer the public a chance to see the universe through a telescope. Once featured on the PBS series "The Astronomers", Dobson said, "Now IF there were a million amateur astronomers with telescopes, and they were willing to let a few thousand people each look through their telescopes, there would be a chance for all of the people in this world who wanted to see, to see." That says it all. John Dobson would like nothing more than for all 6+ billion of us to see the universe and experience its wonder and beauty. Whether our telescopes are large or small, all who look to the skies and wonder are astronomers. We marvel at the things we see, and each in our own way struggle to understand as best we can. Like John, many of us are driven to impart just a tiny fraction of what we have learned to anyone who asks. If enough of us try, someday the rest of the world may know our little secret. That the universe can be understood, and an exquisite joy to experience first hand. In the words of Albert Einstein, "The most incomprehensible thing about the universe, is that it is comprehensible." Its about time, isn’t it? I mean getting around to this follow-up article for learning how to use your now not-so-new telescope. If you’ve followed my suggestions in Q: How Do I Use My New Telescope? Pt 1-The Finder Scope, then you’ve likely also pointed your scope at several other objects, maybe even at some of the brighter lights in the night or early evening sky. Some of those brighter objects might have been planets, and in this respect, if you didn't use any charts you can claim that you've actually made your very own independent discoveries of Saturn, or mighty Jupiter, or maybe even Venus. Star Charts! Everybody needs them and uses one based on what your individual tastes are for how they look and how easy they are for YOU to use. 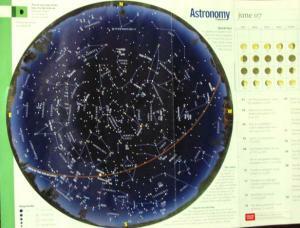 Astronomy and Sky & Telescope magazines give monthly charts, but are these the best for you? But the vast number of objects that you’ll want to see in your telescope are exceedingly dim. One of the best ways to find these objects is to use a star chart, and perform what’s called “the Star-Hop method” of locating deep-sky quarry. I did the same thing and independently discovered Saturn on a cold, clear winter night behind my apartment in Oklahoma City in 1984, as I pointed the little 60mm at a bright “star”, and focused it in. I literally GASPED out loud as the rings of Saturn came into sharp detail. That was it......I was hooked for life! Everyone is a little different, sometimes a LOT different, but the next logical step for learning how to get all you can from your telescope is to use a good set of star charts. I say set because I personally believe its impossible to produce a single star chart with everything on it. But how detailed do YOU need a set of charts to be? We should probably start with the same charts I started with, which is the monthly centerfold chart of Astronomy magazine. (Sky & Tel has similar charts) These charts have their good points and their bad points, and I'll try to explain why I find this to be. 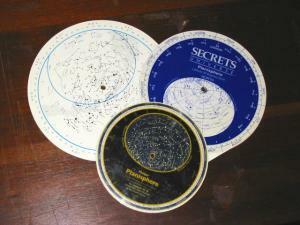 At the time I seriously started into astronomy in 1984-1985, locating things from charts was done by visually identifying certain stars in the sky and on the charts at the same time. Too small of a chart didn't allow for many more stars to be included that are sometimes crucial to finding what you're after. The larger the chart the more dim stars are depicted on the chart and that means many more smaller stars that you'll see in the night sky from a dark location. Planispheres are neat little rotating "wheels" that can help orient the user to see what's up for tonight, or six months from now, and at any time of night. Together with the centerfold charts, they allow for much better understanding of what's going on at any time than either the centerfold charts or the planispheres by themselves ever will. Case in point: A triangular pattern of dim stars isn't shown on centerfold charts because they're too small....the stars of the triangle are too dim. But the larger chart does show them along with the tiny oval almost dead-center of the triangle which is the next object you need for your list of selected targets. I may not have found this dim little oval galaxy with just centerfold charts. If I hadn't gotten my Sky Atlas 2000, I could've possibly STILL been trying to find some of my Herschel 400 objects. Those stars were just barely visible in a dark sky and the little galaxy at the center was easily found and recorded. That's the star-hop method .....comparing stars shown on a chart with what is actually SEEN in the night sky and carefully moving your telescope towards a certain star or pattern of stars to bag your quarry. Its easier than it sounds, too! First, these charts are a FREE inclusion in several magazines each month. They also reveal the changing appearance of the sky as the months pass by over a year's time. The reader sees how the constellations are forever marching towards the west, while new constellations keep appearing on the eastern horizon and replacing what sets in the west. That was something that really grabbed me at the very outset of my self-taught course on amateur astronomy. Click Read More for the rest of the story, and for more suggestions on other star charts. I previously gave some recommendations for buying a telescope in another AOAS website story. Then it occurred to me that a telescope is only as useful as how well its owner can understand how it operates. Just, “…point it up that-a-way!” isn’t a very good idea, although I more-or-less started this way myself. My earliest beginnings would have been more enjoyable if I’d had some helpful suggestions and explanations. STEP 1: Setup in daylight. Learn all the parts and functions of your telescope while you can see them clearly. In darkness, you'll be doing this all by touch alone. I assume, although it may not necessarily be correct, that every telescope owner wants to use their telescope to see something in the sky. That is, after all, the most widely accepted use for telescopes. So, here are a few (hopefully) helpful suggestions on how to make that new telescope live up to some of the promises you expect from it. Oh, and BTW - this is my third attempt to pen a story about “How to Use Your New Telescope”, honestly! I’d get started and the words would just flow and flow…….endlessly……about too many things that you don’t need to know so early in the game. I'll touch on these things in Pt 2. So here is my third attempt, this time with a set of blinders on, so that I can keep this version below 20,000 words, I hope. You’ve bought a new telescope, and you’ve just finished putting the last item together and attaching it to the telescope tube. This will usually be the finderscope since that’s generally the last step in the instruction manual. But what is seldom made plain in the instruction manual is that the finderscope is the most important thing you should learn about. Here’s why….. STEP 2: Locate a distant target. All telescopes “see” a pretty small piece of sky. Almost every telescope’s widest possible field-of-view is only about the size of a quarter if you hold it out at arm’s length. That’s a pretty small field-of-view when you think about it, while the finderscope sees an area about the size of your clenched fist at arm's length. Now let’s abbreviate field-of-view to just FOV, and a big FOV is a popular misconception that most people have about what a telescope "sees". This may be one of your first realizations of many, many future new realizations concerning astronomy. Telescopes do NOT see large chunks of the sky! FOV is different from one telescope to another, but by only a very small amount. What you must understand here is that a telescope’s finder sees a several-times-larger FOV than the main telescope, making it easier to get the telescope pointed in the right area. Learning how to properly setup a finder will assist you in finding almost any target you seek and usually on the very first try. We begin our setup in daytime, outside, with a target at least 500 feet away. 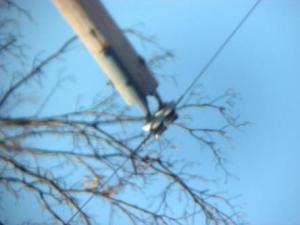 STEP 3: Center something you can see easily, like this insulator on top of that telephone pole. First, a word about eyepieces. An eyepiece is what couples the light from an object to your eye, something similar to the way a speaker couples your favorite music to your ears. Great speakers can make a so-so receiver sound GREAT, and the same is true of good quality eyepieces for so-so telescopes. If your telescope came with low quality eyepieces, consider upgrading to quality eyepieces. It's a cheap way to dramatically improve your image quality in even the cheapest department store telescopes. Eyepieces can help a telescope see a wider FOV, and the eyepiece(s) that were supplied with your telescope are what you’ll start with. The lowest power, or more accurately the lowest magnification gives the widest FOV in your telescope. This is always the eyepiece with the highest number stamped on its side, maybe something like 25mm or 32mm. Click read more for the rest of this finderscope alignment article. Q: What Telescope Should I Buy? One of the most asked questions that AOAS members, or any amateur astronomer faces is, "What kind of telescope should I buy?" This time of year we hear it more often. I'll try to give you some ideas about how you can help steer someone in the right direction the next time you hear this question. Sometimes, asking questions can be most helpful in trying to assist someone in making a choice for a telescope. Ask them some basic questions about, 1) How much they want to spend? 2) What they want to see with a telescope? 3) Where will they use their telescope? And 4) Do they have any restrictions on how much they can lift or carry? These are among the most important questions that will help them make the right choice. Its all about which telescope they'll use most often. They won't be happy with any telescope that they don't, or can’t, use regularly. Some telescopes can cost a small fortune. These are NOT for the beginner. Many amateur astronomers prefer to influence a beginner to first learn the sky, and begin their star gazing adventures with a pair of binoculars. I have sometimes urged people to first attend several astronomy club star parties, where they can look at objects through club members telescopes and then decide if a telescope is right for them. That's also good advice, but assuming you're going to buy a telescope for yourself or someone special, here are my thoughts and advice for you. A basic entry-level telescope will run from about $210 and as much as $500 dependent upon an individual’s budget. You shouldn't invest too much early on until you have some idea of whether you like the hobby of amateur astronomy enough to become more deeply involved. But remember.....to get the most out of whatever telescope you may buy, you'll want to start learning the sky anyway in order to locate the telescopic tidbits dwelling there. These dollar amounts will give the buyer a choice of either a small refractor on a good mount, a small to medium-sized reflector on a simple-yet-sturdy Dobsonian mount (see my story about John Dobson under Topics: Telescopes), or a small reflector on an equatorial mount. Here’s where a little bit of “Telescopes 101” can come in handy. 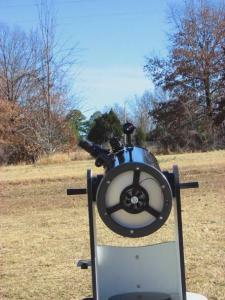 A home-made 80mm f/13 refractor. AOAS member Margaret Brogley asked me to help her restore this telescope built by her brother in the mid-1950's. I built the wooden mount which gave it the stability it needed to work well. Wobbly mounts are a frequent problem found in smaller refractor telescopes. A small refractor is in the 70mm to 90mm range, or for the metrically challenged, a 2.7” to 3.5” diameter of the main lens. For a reflector, a small size is typically a 4.5” or a 6”, while an 8”mirror can be considered by some to be medium-sized. Never be lured into a situation of buying a refractor telescope at a department store. I tell everyone the same thing, “NEVER buy a telescope based on the “Mag Factor” ….magnification is NOT what gives good images. The size of the objective and its quality of craftsmanship are what really count the most. A Wally-World Rosco telescope advertising 650x power isn’t even worth a second glance, except maybe as an example of what you don’t want to buy. There are close objects within our solar system, the moon, planets, comets and asteroids, all of which refractors work very well on, and then there are the galaxies, nebulae, and thousands more objects in the deep-sky available for viewing with 4.5” to 8” (and larger) telescopes. Click read more for more targets, more helpful suggestions about choosing telescopes, and for a group of links to some telescope manufacturers and dealers. 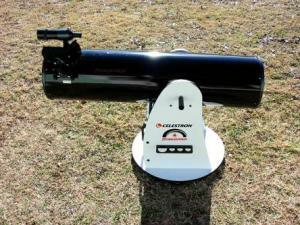 Mike Moffat of the Tulsa, OK, area has produced a beautiful 6" f/8 wooden Dobsonian telescope and after my suggestion that he write about his project for our website, he sent me this story. I applaude his efforts and hope that others will take the time to submit their stories, too, especially if you have built as beautiful a telescope as Mike has. We would encourage anyone who has a story about astronomy, or telescopes, or observing, anything having to do with amateur astronomy, to contribute your story to this website. We'll edit it, and we only restrict profanities and "wild ideas" which can not be substantiated by the scientific method. 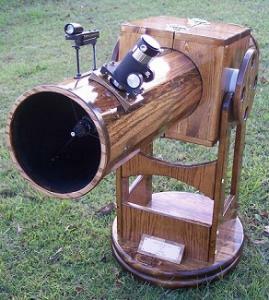 Tulsan Mike Moffatt built this beautiful Coopered tube 6" f/8 Dobsonian telescope during his free time on weekends and evenings. Read his story about this project and then try to decide whether you might want to start your own similar project. My wife says I'm insane when I get an idea to do something and it shows in this project. 4 weeks start to finish (is anything ever really finished??). Wish I had actually counted the hours, but suffice it to say there were hundreds. I have three day weekends that were totally devoted to this project, spending approx. 18 hours each Fri. Sat. and Sunday and every day after work during the week from 6:00 PM to sometimes 3:00 AM. The primary and secondary mirrors as well as the focuser were purchased; all other parts were built in my shop. •	Would I have started it if I had known how much work? Probably not. •	Am I glad I did? Absolutely! •	Will I build another? Already planning it. My pal Shane who has been doing this for 20 years says it rocks for a 6" scope. On two occasions I have resolved A through F in the Trapezium in M42 under my suburban skies. F was not solid but popping in and out as the seeing cleared momentarily as it often will. I am currently chasing after my Messier certificate, 43 captured so far, DSOs seem to have captivated my interest. Jupiter and Saturn of course look outstanding in this scope and the Mars transition this year was astonishing for this newbie. I am a 44-year-old father of 4, grandfather of 2 that until October 2004 never thought much about the night sky. My daughter Sam developed an interest in the night sky and received a department store 70mm Bushnell refractor and all the frustration that went with it. I didn’t know it at the time but a co-worker has been an amateur astronomer and ATM for more than 20 years. Shane brought a newly created 8” Newtonian to work one day for me to check out. Not only was I surprised to learn he was an astronomer I was blown away that someone could make a telescope. He pointed it at the moon that morning and I was captivated both by the view as well as by the workmanship required to make a telescope. I called my wife later that day and asked why Sam didn’t use her scope any more (I had noticed she hadn’t taken it out in a while). She told me that it was too difficult to use and she had gotten discouraged and resorted to just laying in the yard and looking up. An ATM project was born, but little did I know that it would be me that was bitten by the bug and she would move on to concentrate on her music and writing.